Get your ceramic tiles and other hard surfaces shiny clean with no caustic chemicals, no chlorine, no phosphates, no sodium lauryl sulphate, and no propylene glycol! 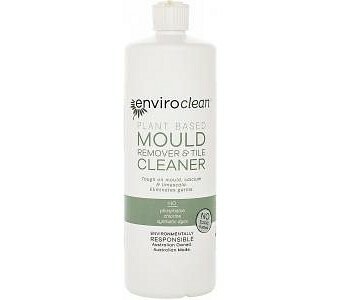 enviroCare Mould Remover & Tile Cleaner uses biological organic acids to do the job, and it does so much more than just remove mould and clean tiles - it also takes care of rust stains and calcium deposits, and it works on glass and metals like aluminium, chrome and stainless steel, so you can use it on all of your bathroom surfaces and fixtures. It’s even a natural antimicrobial agent that kills mould, bacteria and algae to help keep problems from recurring.